The bands Mule, Mike Stinson, Dale Peterson, Random Joe Citizen and Cody Lapow are doing a show in support of the Free Tommy Chong movement. The event takes place Saturday, December 13th at THE CINEMA BAR, 3967 SEPULVEDA BLVD, CULVER CITY, CA, 310-390-1328. Send an email to the organizer for more information. Be sure to bring a pen to sign petitions. Update: Chongstock was a huge success. Mule and others played to a sold-out crowd this past Saturday. Petitions were signed and the crowd went crazy when Mule covered Earache My Eye. Mule says they may do another in the future. Congratulations to Tommy Chong who won the award for "Funniest Person Behind Bars" at Comedy Central's Commies. Cheech accepted the award on Tommy's behalf. To protest Chong's imprisonment Scott Thompson, of Kids In The Hall and Larry Sander's fame, spent the evening in a David Blane-esque booth suspended high above the theater. He sported a "Free Tommy Chong" t-shirt. LA Weekly has published an interview Precious and Paris Chong, two of Tommy's children. In the article, they describe the events surrounding the arrest, what it was like being raided by the feds, Chong Glass and more. California magazine, LA City Beat published an in-depth story about Tommy Chong's arrest which includes an interview with Tommy Chong and Cheech Marin. During the interview, Chong says that it was a mistake to plead guilty and felt like he was ambushed. He also said that Taft had to change the visitation rules because people were visiting inmates just to get photos with him. When he was arrested, he was in the middle of writing his auto-biography. The book will now include a detailed account of his arrest and prison life. The completion date for the book is unknown at this time. On today's Howard Stern Show, the band Staind admitted to smoking pot with the dopemaster himself, Cheech Marin. They wouldn't elaborate, but said that Cheech was trying to hide what he was doing so his wife wouldn't see. In case you didn't notice, Cheech and Chong Dot Com has been running live spots on the Howard Stern Show all week. The next one airs tomorrow during the 8 o'clock hour (eastern time). With Ashcroft's crew on hand, a federal judge ruled today that Tommy Chong will not be released pending appeal. There is still no word on whether or not the spice, oregano, will be outlawed because it sort of looks like marijuana. Cheech Marin and Robie Chong, Tommy's daughter, appeared on this evening's edition of At Large With Geraldo Rivera. The Fox News Channel program reiterated much of what we've heard already...a comparison of Limbaugh and Tommy, as well as a debate on the first ammendent. We also learned that Cheech was the best man at one of Geraldo's many weddings. The quote of the day came from Cheech, however. When asked if he's concerned that he'll get in trouble for making movies about dope, he replied "everyone smokes dope." On Monday at 8 PM EST, the A & E Network will present a show titled "American Comedy: What's So Funny." The show asks various comedians, including Cheech Marin, what they consider funny. "They really arrested my character...the stoner musician was just a character...they [the feds] told me if I didn't plead guilty, they would indict my wife and son...they said if I plead guilty, nothing [would] happen." In other words, the feds lied. New York Times reporter, Joyce Walder, interviewed Tommy at the Taft prison. During the interview, they discuss the new High Times movie, Potluck, his arrest and Rush Limbaugh, among other things. If you're in the New York City area, be sure to catch a screening of High Time's Pot Luck. Potluck is currently showing at the Village East Cinema - 12th St. & 2nd Ave. - through 10/23. The movie stars, among others, Tommy Chong and Jackie Martling. Here are hightlights from Allan Handelman's interview with Tommy Chong's wife, Shelby. Cheech, unfortunately, was a no-show. Keep in mind that this is the first time Shelby has spoken to the media about the miscarriage of justice. Chong's legal problems began after two undercover agents in Pittsburgh purchased bongs from Chong Glass. Apparently, it is illegal to ship bongs via mail to certain states. PA is one of them. A new salesman was unaware that there were such shipment restrictions and sent the bongs to this fake headshop. The Chong's are suing Bill O'Reilly for falsely stating that Tommy had been arrested eighteen times previously for drug-related offenses. Such a claim may have negatively impacted Chong's upcoming appeal hearing. The Cheech and Chong reunion movie has been delayed by one year, but New Line said they will wait for Tommy. Cheech Marin and Chong's wife, Shelby, will be doing their first live interview this Sunday on the Allan Handelman Show. The syndicated radio show is based out of the Carolinas, but can be heard live on the web. At yesterday's hearing, one of Chong's attorneys argued that Chong should be released pending his appeal. The judge disagreed, stating that he feels the sentence was fair, but will allow his attorneys to present their case next Wednesday. Tommy Chong reported to prison today to begin his 9 month sentence for selling bongs. The prison, located in Southern California, is the same prison where Robert Downey, JR also served time. Chong may be released on October 16th while his lawyers file an appeal. As reported earlier, his lawyers are looking for house arrest in lieu of a prison term. Fox TV has postponed the premiere of Cheech Marin's new sitcom, The Ortegas, 'till November. Apparently, they didn't have enough room on their schedule. Tommy is appealing his recent sentence. He is attempting to be put under house arrest. Be sure not to miss tomorrow's edition of Celebrity Justice. Cheech Marin will comment on Tommy's recent sentencing. Check your local listings for air time. Update: In summary, Cheech said "They prosecuted Tommy for who he is, not what he did....what he represented and the image he represented to all of us...crucified as a warning to everybody." Cheech didn't provide insight regarding the reunion. Cheech Marin's latest film, Once Upon A Time In Mexico, made a killing at the box office this weekend. The film earned a whopping $34 million, making it the third biggest September opening ever. This afternoon Tommy Chong was sentenced to nine months in prison, proceeded by one year probation. Everyone is shocked. New Line plans to continue development on the reunion film, but Tommy's sentence will certainly push back the release date. Tommy is still scheduled to perform his stand-up with his wife, Shelby, this weekend in Arlington. How does Cheech Marin find the time? Not only is he working on Fox TV sitcom, The Ortegas, but he also began filming Silver City, a crime drama starring Daryl Hannah. But wait, there's more. He just signed with Miramax to do The Underclassman, a film about an undercover cop who discovers a private school crime ring. Cheech stars as the police captain. Thanks to Cokewater for this info. The next time you're in San Fran be sure to visit Ana Mandara. This Vietnamese restaurant is owned by Don Johnson and Cheech Marin. It receives rave reviews. Once Upon A Time In Mexico, the sequel to Desperado, will be released September 2nd. The film stars Johnny Depp and Cheech Marin. Spy Kids 3-D earned $32.5 million this weekend, making it the #1 film in the country. Cheech, of course, returns as Uncle Frank. New Line will begin filming the yet untitled project during (possibly Get Blunt) Cheech's The Ortegas hiatas next summer. They are even considering doing a live stand-up performance to promote the movie. The third installment of the Spy Kids series premieres next Friday at theaters everywhere. The making of Spy Kids 3D is currently airing on the Disney Channel. Check your local listings. On July 13th, 1946, Richard Marin was born in Los Angeles, California. Happy 57th, Cheech! ABC's Eyewitness News reports that Cheech Marin and Placedo Domingo are teaming up to do voiceovers for the first hispanic-themed animated film. It's about a girl who needs to rescue her father, as well as save a sea creature from extinction. Yes, the day is finally here. September 2nd, Cheech and Chong's Next Movie is coming to DVD. Now you can complete your C & C DVD collection. We are now taking pre-orders. All orders over $25 are eligible for free shipping. C & C fan, James, sent us info on a humorous political cartoon from Canada's Globe and Mail newspaper. The cartoon makes comment on Canada's legalization of marijuana. Yes, it's that time of year again. Friday, May 24th is Tommy's birthday. Sixty-five years ago the king of dope was born in Edmonton, Alberta, Canada. 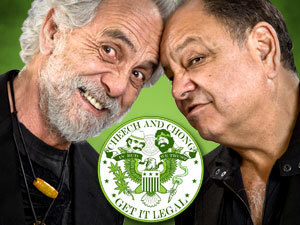 By the way, Tommy Chong and Cheech Marin have just about completed the script for their new movie, Get Blunt. In the film, Cheech and Chong create a hair tonic for baldness made of hash oil. As a result, the DEA, pharmaceutical companies and the police are in hot pursuit. At this week's "Up Fronts," Fox Television announced it has picked up Cheech Marin's The Ortegas. The premise...Cheech is a dad whose son has a radio station in their backyard. Tommy Chong has pleaded guilty to selling drug paraphenalia over the internet. The charges are a result of February's DEA raid of a number of internet headshops. Tommy's home had been raided for his alleged involvement in Chong Glass (site's now down) which is operated by his son, Paris. Tommy was released on $20,000 bail and a sentencing hearing was set for September. Tommy could face up to 5 years in prison and a $250,000 fine. Cheech Marin returns as Uncle Felix in another Spy Kids sequel this summer. Sylvester Stallone joins the cast as the Toymaker and Steve Buscemi (Reservoir Dogs, Sopranos) will be making his second Spy Kids appearance. Cheech Marin will host the 4th annual Trinity Children and Family Services (Trinity) Golf Classic on Monday, May 12, 2003. Celebrities will team up with Trinity for this exciting charity tournament in Palm Desert, CA with the goal of increasing awareness and support for the fight against child abuse and to raise funds for Trinity’s programs. It's a day of golf, dinner, and socializing at the BIGHORN Golf Club. Teams and celebrities will tee off, sharing a fabulous game of golf while supporting the largest nonprofit provider of childcare services in the country. According to a Denver Business Journal article, Marin and Chong have put Get Blunt, the script Rae Dawn Chong wrote, on the back burner. They both decided that it was unrealistic to have Tommy portraying a drug counselor so they are both co-writing a new screenplay that involves marijuana lotion. The movie will begin where movies like Nice Dreams and Still Smokin left off. Just like (or almost like) the old days, the legendary comedy team is back together, writing together. Smoke on!